2010 Update: All new dolls up now! 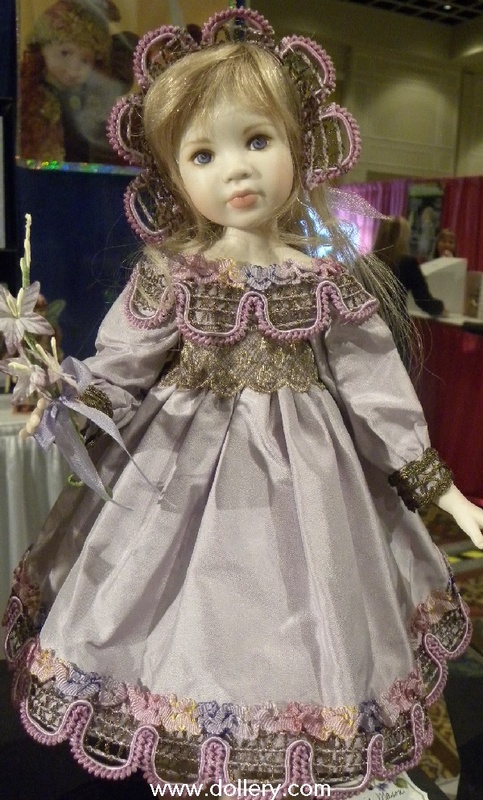 Linda Mason is a talented artist who attended many of our early doll shows. We have carried her work throughout the years. She is constantly winning industry awards. Linda's porcelains are wonderful this year. 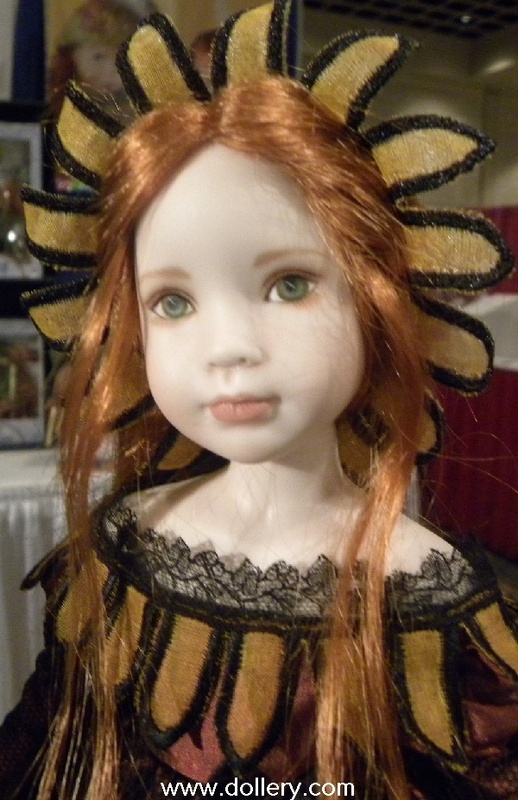 DOLLS 2010 - These are quick photos we took at Idex. We will be updating the site with all the details. Be sure to email kmalone@dollery.com now for more info. 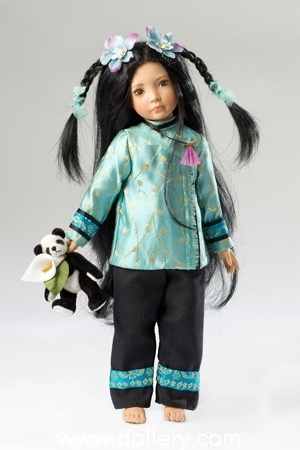 All dolls have hand painted eyes with human hair or synthetic mohair wigs. They are 12" doll with cloth body and wire armature. Crickett, The Vintage Series, LE/2 costume, 12"porcelain, , Antique netting and lace with vintage trims and flowers. Blond hair, blue eyes. These 2 have been sold but similar can be ordered. Crickett, The Vintage Series, LE/14 costume, 12", porcelain, 1920's yellow and green cabbage rose voile fabric with vintage flowers. Blond hair, blue eyes. Crickett, The Bonnets & Blooms Series, LE/16 costume, 12", porcelain, Blue silk dress with hand-loomed pansy petipoint bodice. Blond hair, blue eyes. Handmade straw bonnet. Crickett, Yesterday's Frocks Series, LE/25 of costume, 11", porcelain. Off-white batiste with coral and lavender silk ribbon embroidery. Blond hair, blue eyes, hand made straw bonnet with vintage flowers. Keira, The Bonnets & Blooms Series, LE/25 costume, 12"porcelain, Green silk dress under a white pinafore with hand-embroidered alpine flowers. Brownish-black hair, brown eyes. 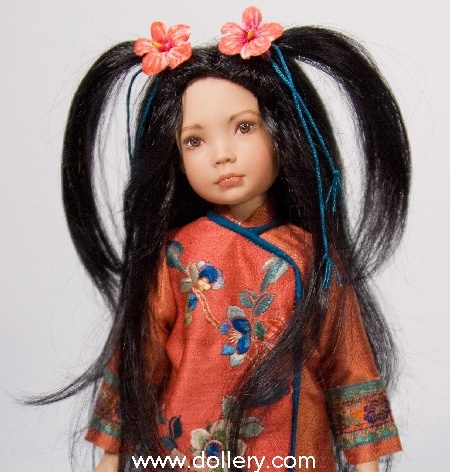 Lilly, The Vintage Series, LE/7 costume, 12" porcelain, Traditional Chinese costume made from vintage fabrics and trims. Brownish-black hair, brown eyes. Lilly, The Vintage Series, LE/15 costume, 11" porcelain, Vintage netting sundress with vintage trims Brownish-black hair, brown eyes. 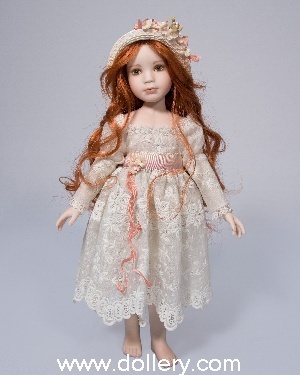 Mackenzie, The Vintage Series, LE/2 costume, 12" porcelain, Antique eyelet dress with vintage ribbons and flowers. Red hair, green eyes. These 2 have been sold but similar can be ordered. 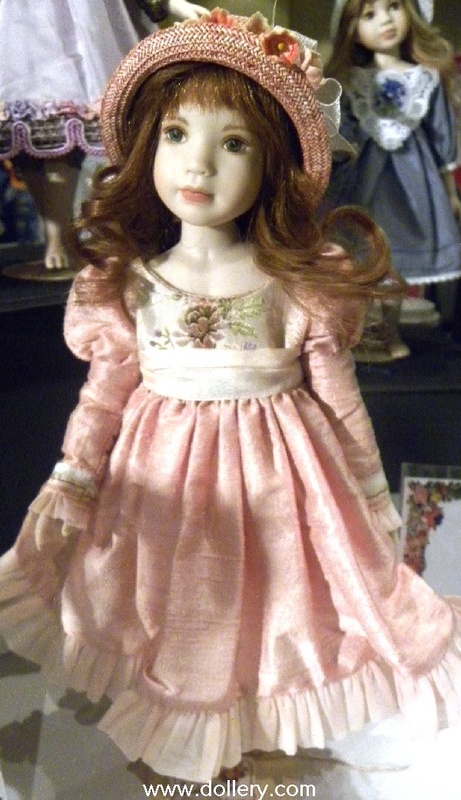 Crickett, Lil' Princess Series, LE/35, 7-8" seated, cloth body with armature. Blond hair, blue eyes. Lavender silk with green and pink accents. Crickett, The Vintage Series, 12", cloth body with armature, LE/15. Floral voile with green straw hat. Blond hair, blue eyes. Crickett, Today's Togs Series. LE/35 11" all porcelain body. Pink & blue striped silk sundress. Crickett, Yesterday's Frocks Series. LE/35 11" all porcelain body. 1920's Stye, white batiste with lavender and blue embroidery, blue straw hat. 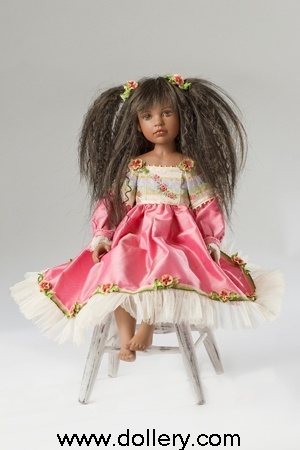 Kiera, Lil' Princess Series, 7-8" seated cloth body with armature, LE/35. Hot pink silk with ecru and green accents. Brownish black hair and brown eyes. 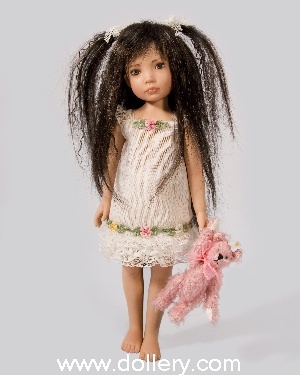 Lanie, Lil Princess Series, 7-8" seated, cloth body with armature. LE/35. Pale blue and gold eyelet, gold crown, blond hair and lavender eyes. Lilly, Today's Togs Series. LE/35 11" all porcelain body. Orange & green striped silk sundress. 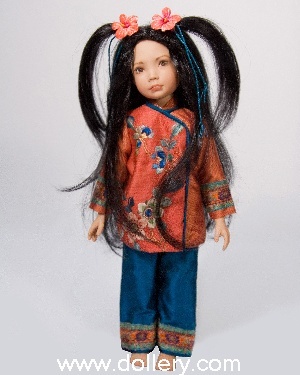 Lilly, 12" cloth body with armature, LE/25, Aqua brocade traditional Chinese costume. 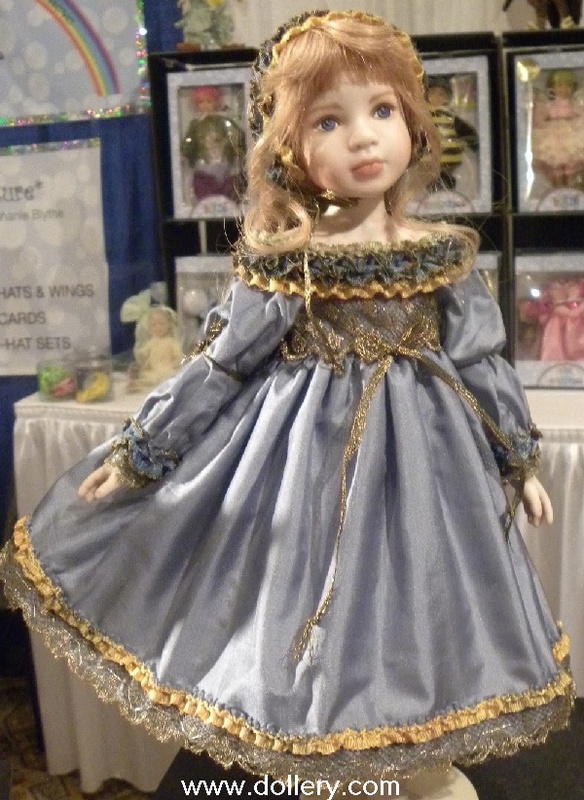 Mackenzie, Lil' Princess Series, 7-8" porcelain seated cloth body with armature. LE/35. Seafoam green netting over ecru silk, peach accents, red hair and green eyes. 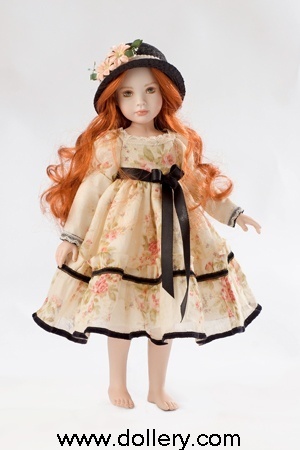 Mackenzie, The Vintage Series, 12" cloth body with armature. LE/15. Floral voile with black trims and straw hat, red hair and green eyes. Taffy - Resin Ltd 35, 18", black synthetic wig, brown hand painted eyes, peach silk dress with silk chiffon overlay, silk ribbon embroidery accents, handmade peach stockings with handmade peach shoes.